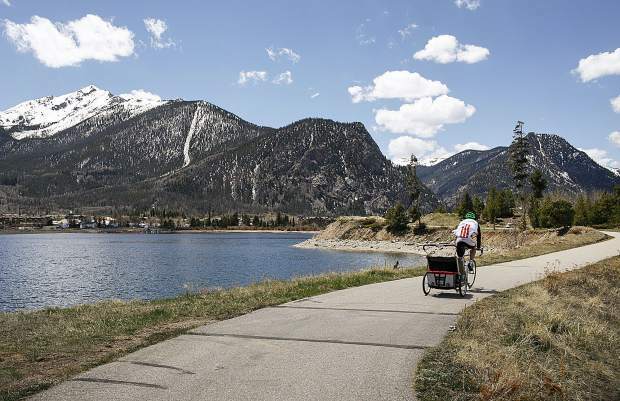 A cyclist bikes the Dillon Reservoir recpath Thursday, May 10, in Frisco. Summit County has officially opened up its recpath network for the 2018 season. As the snow melts and the sun shines, Summit County is opening most of its recreation path network a few weeks early this year. Most of the recpath has been plowed, cleaned and maintained for another season of walking, hiking and biking. A section of the Tenmile Canyon path between Frisco and Vail Pass remains closed for the time-being due to avalanche risk. Thirty-eight miles of the pathway are maintained by Summit County, while another 17 miles are maintained by the towns. The path features a wide range of difficulty levels and stunning views, including the Dillon Reservoir recpath which rings the lake with mountain backdrops from every angle, the Upper Blue recpath that runs from Frisco to Breckenridge, and the Snake River path that winds from Dillon to Keystone. Brian Lorch, director of the county’s open space and trails, said that recpath opening day is something everyone looks forward to during the shoulder season. Lorch said that a section of the Tenmile Canyon recpath, the county’s steepest trail which runs near Tenmile Peak and Peak 4, will remain closed as it runs close to and under several avalanche paths. While the snowpack thaws, the county contracts the Colorado Avalanche Information Center to assess avalanche danger around the area, and they feel the area around Tenmile Canyon is still too unstable. Brad Kemske, a seasonal crew chief who works on the recpaths during the summer, hopes that path can be opened up soon. Another portion of the Blue River recpath will be diverted to a closed-off section of Highway 9 between Gateway Drive and Stan Miller Drive while the town of Breckenridge installs pipeline for its second water treatment plant. Work on that recpath is expected to end by Memorial Day. Kemske, whose crew sweeps, repairs and marks trails with signal paint, wanted to remind residents that they can volunteer to help keep the trails safe and clean for everyone through the summer. For more information about the county’s recreation path network and open space, visit CO.summit.co.us/105/Open-Space-Trails.